It’s rotten to have to give a bad update. When you take time to dig the soil, amend it, select the plants and plunk them in the ground, you hope it all works out and that you get to eventually taste something yummy. It’s bad news for the garlic we so carefully planted way back in the fall and the young onions, too. Mother nature had something else in mind when on the winds came a little yellow-headed fly. That critter laid her eggs on the onions, garlic and leeks. When they hatched the “worms” ate their way down to near the bulbs. Being full enough of onion or garlic leaves they transformed themselves into pupae and that’s what we found. Little brown grains of rice – actually they’re smaller than grains of rice but easy to see against the white Allium fruits. 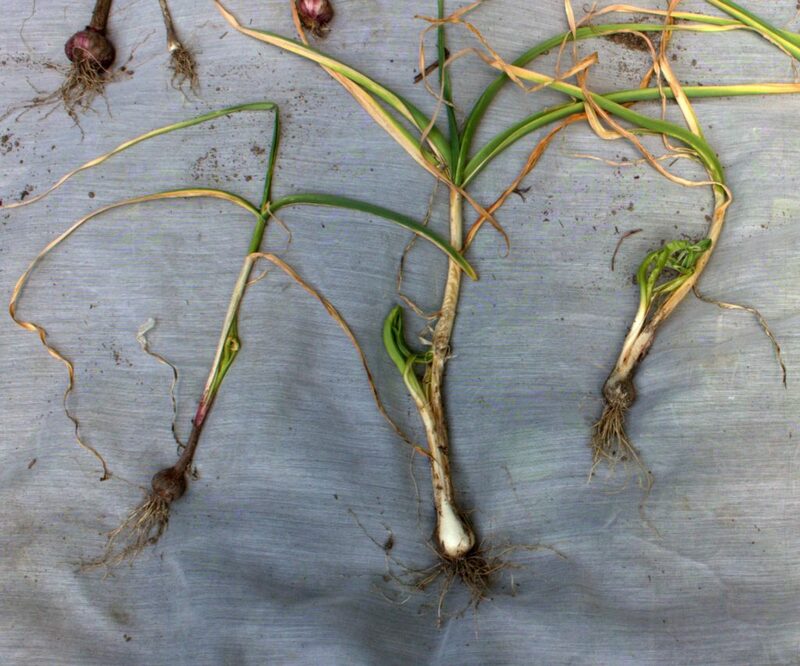 Deformed leaves of garlic weren’t obvious in their early growth. So, I decided to go out and remove the snow that accumulated on the sheets in the garden. We got a couple of inches of snow Friday morning and then lots of blowing snow during the afternoon so Mother Nature told me to forget it. “Your bulbs will be ok“, she said. 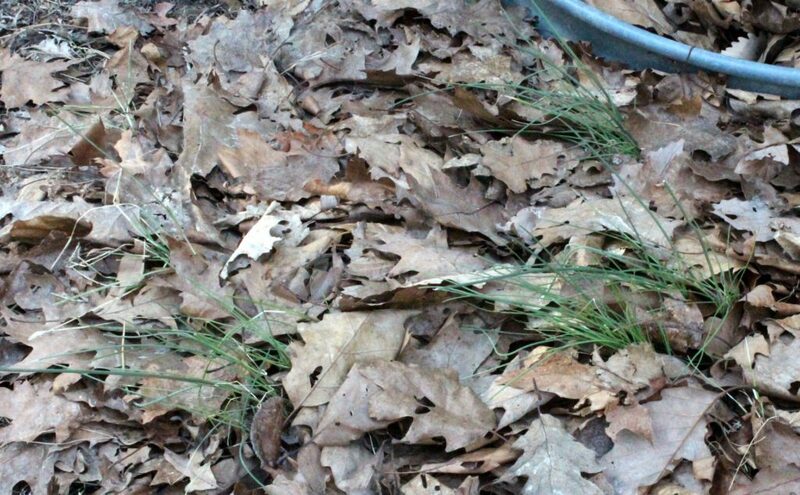 I could only wonder if the shoots looked healthy underneath the sheets. 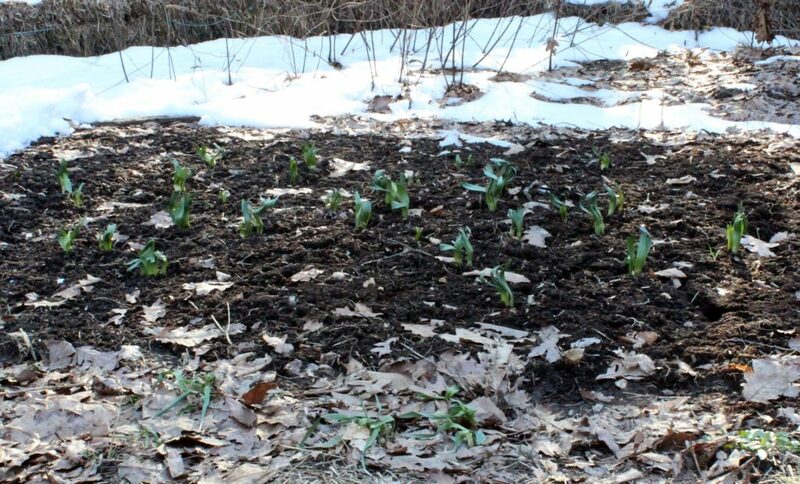 Then, a huge snowfall of 15 inches came the following Tuesday, so I was really wondering about how the plants would fare. Finally, the snow had compacted to a few inches and hardened with some really cold nights was reduced to very little left with the heat of the sun. The sheets were removed today, the 23rd, but not until a week and a half after that really big snowfall – on the 14th of March. The flower bulb shoots are bent over but I have a feeling they’ll straighten out some before they treat us with their beauty. 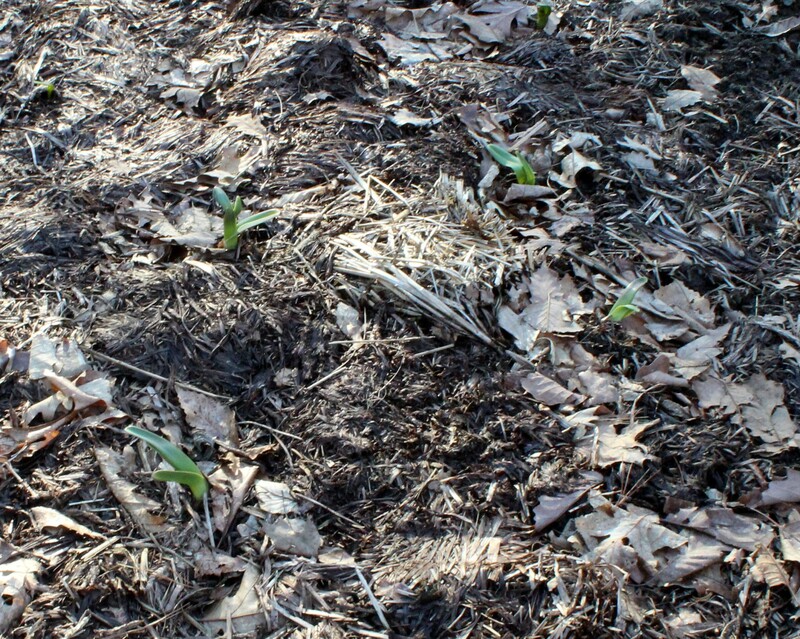 Tulips and narcissus bulb shoots have grown in the last month. Garlics and chives seem very alive and green as well. I guess we’re good to go! 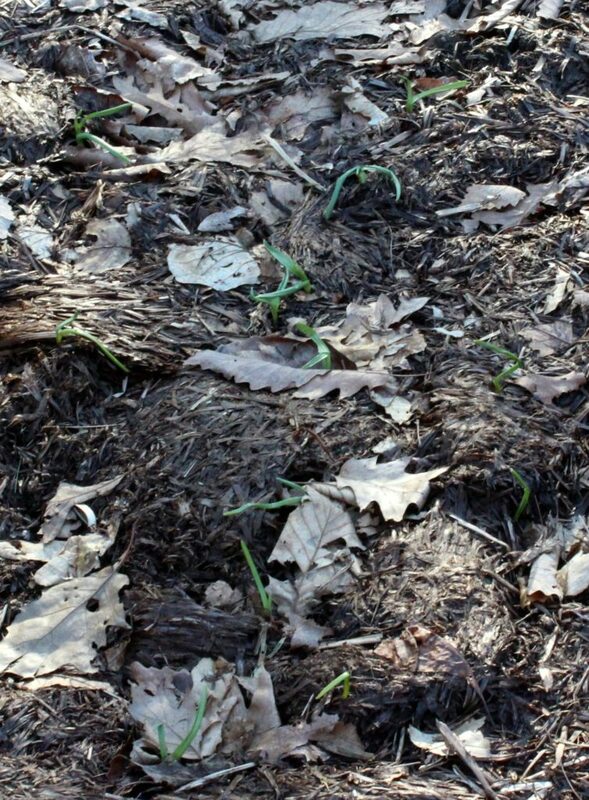 Elephant garlic sprouts were uncovered after the last coldest night which got down to the high teens. Elephant garlic sprouts promise to bring big tasty bulbs. 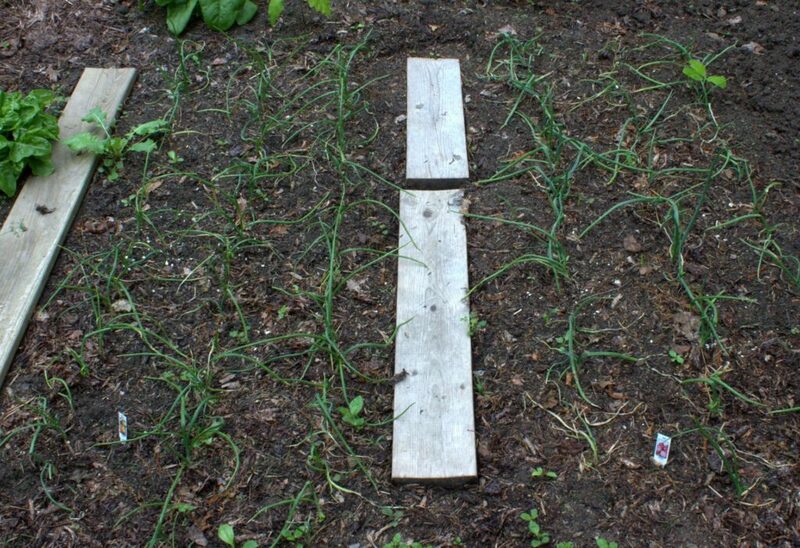 Other garlic varieties that are sprouting are Duganskij and Chesnok Red. Normal-sized garlic sprouts have bent over tops from being covered with a sheet. Chives didn’t seem to be too bothered by the extremes in the weather in the last month. Chives plants ready to be snipped for the kitchen. So far, the chives are ready to be used/eaten. The garlics will have to wait a few months until we get well into summer.